Why Choose Allagash Guide, Inc.? – Allagash Guide Inc.
Why Choose Allagash Guide, Inc.? You are here: Home / Why Choose Allagash Guide, Inc.? Here are just a few reasons why Allagash Guide, Inc. is just not your average canoeing outfitter. We use Old Town Canoes, which are the best in the business. Our Food selection is top quality. Safety is always first. We carry an excellent First Aid kit. We give instruction in canoeing that will last a lifetime. Our tents are top notch Eureka Timberline Outfitters. We provide a great outdoor experience without the lack of comfort. We carry a Satellite Phone for extra safety and contact with the outside world. Our testimonials and references listed are many. Our experience in the business spans more than 35 years. Repeat customers are the norm, not the exception. Our pictures within the web site tell our story. We offer free lodging the night before and the night after a trip. We will do whatever is possible for special needs and diets. As educators we are constantly teaching history, geology, forestry, and natural history of the trip. We use a Baker Oven to create meals beyond the normal camping/canoeing trip. All of our trips are fully guided and outfitted with the best equipment available for comfort and safety. 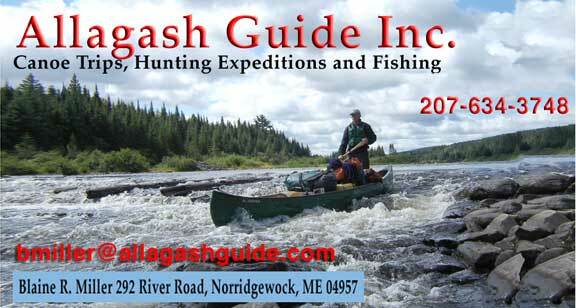 We provide maps of all Allagash and West Branch of the Penobscot River Trips to all clients. We loan waterproof bags and Thermarest mattresses to all clients who need them. We create trips for clients to new and unique areas.